You can easily hide or show the “Macintosh HD” main hard drive from the desktop of Mac OS X, along with any other internal volumes and removable drives by adjusting some Finder options. These changes take effect immediately. Through these preferences you can adjust the visibility of Macintosh HD and other internal hard disks, external drives, CD’s, DVD’s, iPods, and even connected servers. 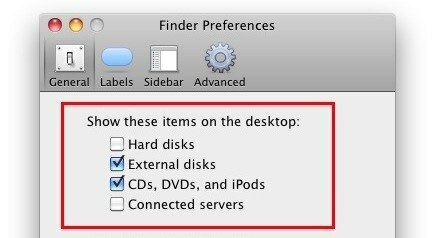 Macintosh HD is categorized under ‘Hard disks’ so if you leave it checked, then Macintosh HD (or whatever you have named your hard drive) will remain visible. Each drive will have a unique icon visible on the desktop. Icons for volumes will represent what the actual media or volume is. For example an internal hard drive looks like an internal hard drive, and external drive kind of looks like an external hard disk in an enclosure, CD and DVD looks like optical media, and so on. If you’re a minimalist or you just don’t like the desktop icons and the clutter they can cause, you can always hide all desktop icons in Mac OS X with a simple Terminal command as well. Having icons for Macintosh HD, hard drives, external drives, disc media, and other volumes show up on the desktop had been a long standing feature that was in classic Mac OS, and some of those external volumes persist today in modern Mac OS releases too. Thanks to settings, you can customize these icons on your desktop exactly as you’d wish. When you plug in your iPhone, shouldn’t that appear also? Mine does not. Also, how does one get the “Shared” column in the finder window? Thanks much. iPhone and iPad does not appear, but my old iPod does. I never understood this either. How is this done with a terminal command? very strange, because it is the main SSD (only SSD in machine), but the Operating System is interpreting it as an external disk, not as HardDisk.